Do any of the established scooby guru's have a work around for the 300g/s MAF limit on newage Scoobs or if you know your way around a 16-bit ROM do you know how to patch the ROM to get rid of the limit and make it limitless or at least increase it?? Rescaling the MAF is no problem and an aftermarket ECU is not an option at this time. I use RomRaider, ECUflash and ECUexplorer and a Tactrix cable. I don't do HEX or XML or know how to use a ROM dissasembler but hopefully you do. I've now located and read completely what's involved for the MAF workaround (complete rescale of every Load scale per table used, AF learning, MAF scale, inj scale /*2) and that would raise the limit to 352 g/s with the std diameter MAF housing or theoretically up to 600 g/s using a larger MAF housing. It's all very dooable and straight forward although logging would be confusing for a while until you remembered to multiply the affected column results *2. I think ultimately the best way forward on this is to either have the MAF g/s and Engine Load limits on the ROM hacked/patched so it ends up working as if it came direct from the factory as std using all the OEM table scalings so you just keep rescaling the MAF table as you reach each g/s limit you set, with no ceiling, or you get an aftermarket ECU and run MAFLESS instead which is probably better in the long run as you get complete control of everything with absolutely no OEM limits at all!! I answered my own question!! AF mixture you can correct using WB lambda (innovate lc-1 most popular) and so you don't need to hack MAF. Can you explain what you mean as i'm a bit confused by your answer. What does altering AFR have to do with it? I'm asking how to defeat the 300 g/s MAF limit that newage EDM subaru's upto MY05 are subject to. This is something that's hard coded on the 16-bit ROM for my ECU. I hear what you're saying and ultimately i will go that way however for now that's not an option and i am trying to get the most out of what i've currently got. Later on in 2009 i'll get a decent turbo and modify my injectors, then i'll probably be looking at a new ECU but not until then. Right now and over xmas i'll be porting my Turbo hot and cold side, 3-bolt Uppipe and GT Spec Headers to see if i can liberate a few more ponies till i make bigger changes. I know a chap that runs a bigger MAF on a well modified MYO6 STi. The limit on the 32-bit ROM is 500g/s and he's already used all that and not broken his MAF just yet but as you've said the standard MAF may be too fragile. Anyway......There's only one way to find out!! Last edited by ScoobieWRX; 31 Dec 2008 at 09:08 AM. Reason: Spelling!! It's a VF35. Peak boost currently is around 20psi. I had a chat with Paul at Zen and he's given me some decent pointers on where to port and by how much. Getting some boost creep/spiking as well so porting the wastegate should help with that. I'm not that far off maxxing the MAF now so hopefully this will get me to the limit of what's possible with my current setup. Flowing 286g/s max right now with std induction pipes. I've got a Samco Airbox hose and turbo inlet hose to put on, that should help a bit. A bit more mapping once i've ported and hopefully we should be stroking the limit. I'm hoping to get boost up to 22psi (1.5bar) on 99RON so fingers crossed. I'm a strong believer in getting as much as i can out of what i've got without blowing it all up before making big changes!! Dosh permitting it won't be too long before i can take it to the next level. has it been fully mapped? 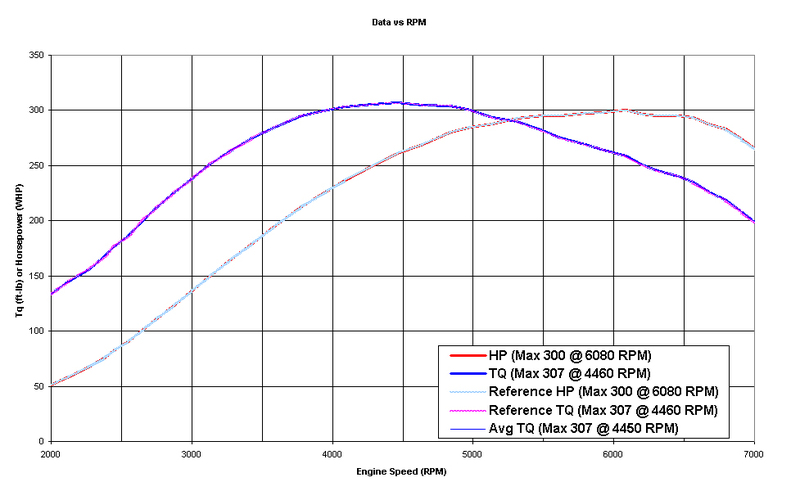 300bhp from a decated mapped sti8 is pretty low, i'd be expecting nearer 330's at least. what injectors and fuel pump are you running? That's 300bhp/307lb/ft at the wheels not the flywheel. Conservatively figuring in 16% for drivetrain losses it's at somewhere near 357bhp/365lbft at the flywhweel. Std Pink injectors, walbro 255 pump and aftermarket fuel pressure reg. It's not decatted as it has a 100cell high flow cat in the downpipe. Last edited by ScoobieWRX; 24 Dec 2008 at 12:16 AM. ahh righto, makes more ence now, is it still on the vf35? or has that been changed? Still on a VF35 till next year some time. I'd have said that's pretty good for a std VF35 and this puts some of the rubbish that's banded about by so called enthusiasts about the limit of this turbo being around 325-330 bhp into context. It's clearly capable of a lot more than that and when i've done some proper porting flow will improve significantly i hope. If i could squeeze 390-400bhp out of this i would be very happy. Last edited by ScoobieWRX; 24 Dec 2008 at 12:11 PM. - Removed headers and ported them to the same ID for each port as the holes in the gasket so there is a smooth flow with no obstacles in the way. - Ported exhaust outlets (on each head) which weren't concentric as Paul at Zen said they wouldn't be, so they are now!! Again ported to the same size ID as the gasket and now a perfect match for the headers. - Ported the headers exit (3 bolt flange end) to match the gasket ID. - Ported bottom of the uppipe to match the 3 bolt flange. - Ported the uppipe exit as much as i felt was safe to do without compromising the integrity of the pipe, again following the shape and ID of the uppipe to turbo gasket. - Turbo: Hot side inlet and oulet. Downpipe entry ported to match turbo exhaust oulet. ...and if that wasn't enough!! - Purchased and fitted a new silicone turbo inlet hose from RCM. No inlet header removal required. Excellent fit and top quality product!! New silicone turbo oulet to intercooler hose and silicone intercooler to throttle body coupler, and silicone airbox hose and Aluminium coupler to turbo inlet hose. It was an interesting experience and a task not to be undertaken by the faint hearted. To be honest without all the right tools and bits for porting it would have taken me weeks to do just using normal grinding stones so i invested in some proper carbide burring tools to remove the bulk of the metal, then different grades of stones to get the shape and smoothing of the internal surfaces, finished off by using fine grit flappers and fine wire brushes. Baring in mind this was all done by hand the key thing here is that without jigs and machinery to set everything up the best advice is to go carefully and take your time!! Having done some logging today just to get an idea of what needs to be done mapping wise i was chuffed to see i'd pegged the MAF good and proper!! I have decided to start mapping from absolute scratch all over again now as the car feels completely different to drive and feels like the turbo could handle a lot more. It doesn't spool up much earlier but when it's on song it does so more quickly and solidly. It's holding boost 1.3bar right up to the redline and that's just with the old map so we'll see how well i can exploit that further. It seems to me that i can now dial in whatever i want up without fear of making the turbo a flamethrower. Right now my only limitation is the MAF. 400bhp here we come!! If anyone asks me to do some porting for them i would advise you in the nicest possible way to DIY!! Although i enjoyed doing it, now have some extra knowledge and another skill it was a long hard job and would have been made easier if i owned a bloody machine shop! !